Our Preference: SHORT positions below 1511 with 1500 & 1490 in sight. Alternative scenario: The upside penetration of 1511 will call for a rebound towards 1520 & 1527. Comment: the price is facing a resistance area around 1508. Our preference: Short positions below 0.954 with targets @ 0.948 & 0.9455 in extension. Alternative scenario: Above 0.954 look for further upside with 0.956 & 0.959 as targets. Comment: the pair has rebounded on its support but remains below its resistance. Our preference: Long positions above 1.0735 with targets @ 1.0855 & 1.0885 in extension. Alternative scenario: Below 1.0735 look for further downside with 1.0675 & 1.065 as targets. Comment: the pair is pulling back on its new support (former resistance) ahead of further advance. USD/JPY intraday: capped by a negative trend line. Our Preference: SHORT positions below 82 with targets @ 81.25 & 81.1. Alternative scenario: The upside breakout of 82 will open the way to 82.45 & 82.75. Comment: the pair is capped by a declining trend line. Our Preference: LONG positions above 1.6425 with targets @ 1.6535 & 1.657. Alternative scenario: The downside penetration of 1.6425 will call for a slide towards 1.6385 & 1.633. Comment: the support area at 1.6425 maintains a strong bullish bias. Pivot: 1.4580.Our Preference: LONG positions above 1.458 with 1.4735 & 1.48 in sight. Alternative scenario: The downside penetration of 1.458 will call for a slide towards 1.4505 & 1.4466. Comment: the pair has broken above a bearish channel resistance. However, the RSI is close to a resistance area limiting the immediate upside potential. Tin được đăng bởi: Unknown on 4/27/2011 03:44:00 PM. Tin tức thuộc chuyên mục: Nhận định thị trường . BantinForex.net là kênh thông tin, tin tức, tư vấn, cung cấp kiến thức về thị trường Forex - Vàng. BantinForex.net là đối tác của sàn giao dịch Forex.com – Gain Capital Group làm việc tại Việt Nam. 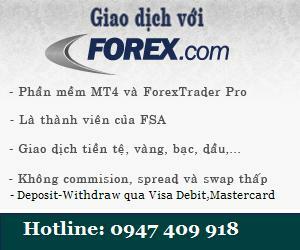 Chúng tôi có nhiệm vụ tư vấn và hỗ trợ khách hàng đăng ký tài khoản Forex.com - Gain Capital Group và cung cấp chiến lược giao dịch,công cụ đầu tư hiệu quả.